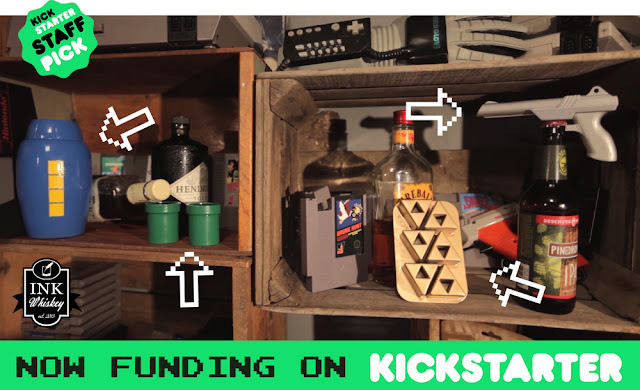 From Ink Whiskey, the same company that created NES-style cartridge flasks, is back on Kickstarter with another round of drinking products. Their campaign is nearing the goal with about 2 weeks still left to pledge. The new Bartendo set includes Warp shot glasses, Capper Gun bottle opener, ice cube Tray Force, and the Kega Man double pint. Some bonus items available for this Kickstarter campaign include an exclusive "Kid Liquorus" flask and also a Nanoarcade tabletop gaming system that I've featured on RD80s in the past. Head over to Ink Whiskey's Bartendo campaign on Kickstarter and pick up a set for your next retrogaming party!